Some runners were impressed by decent cushioning and support of the Brooks Asteria. It is a road racing shoe that is comfortable to wear, according to some users. Many testers mentioned that the shoe feels light and fast. The Omege Flex grooves deliver flexibility. The mesh upper is breathable enough to keep the foot well-ventilated. Many runners noticed the secure fit and gave positive feedback to the shoe’s well-padded tongue. Toe box is roomy and the heel locks in the foot without slipping, based on user’ review. Some runner noticed that the Asteria is too narrow for their liking. Few users disliked the bright colors of the shoe and the unavailability of the other color options. The Brooks Asteria is a road running shoe designed for racing and uptempo training. Many runners lauded the shoe's decent cushioning, flexible platform and breathable coverage. There are also a few who dislikes the shoe. but in summary, the shoe is best for mild pronators as it delivers reliable support and speed. When runners think of racing flats, they generally think in terms of speed. The word support does not usually come to mind, but that’s what Brooks offers in the unique Asteria model. Does the Asteria deliver on speed and support? See the verdict below. The breathable mesh upper on the model I received from Brooks provides for a perfect Goldilocks fit. The fit in the heel area is exemplary for a racing model and results in zero heel slippage while running. What makes the Asteria unique is its rearfoot guide rail system, a type of dual density firm support material that wraps around the back of the heel. That’s right, the Asteria does not offer a medial post but instead a brace behind and around the heel area. This is intended to support the feet of mild pronators on long runs. The sole on the Asteria is surprisingly grippy for a racing flat. When combined with the properly snug fit upper, this means no slipping or sliding on road runs. The BioMoGo DNA cushioning gets an A grade when it comes to being protective. I could feel the different grades of surface under my feet, but there was never any discomfort from stepping on something hard or sharp. The Asteria offers B level responsiveness, which is just fine. There’s a decent amount of springiness and bounce but not so much that it will slow you down in a race. The blown rubber forefoot contains one very deep flex groove, sufficient for its intended purpose, and what Brooks calls forefoot propulsion pods. The pods provide excellent cushioning but in an unobtrusive way. How to describe the feel of road running in the Asteria? Well, if you ever ran in the Pearl Izumi EM Road N1, which offered a “lightweight and buttery smooth underfoot” (Pearl Izumi) and a “fast dreamy feel,” you will feel like you’ve re-encountered an old friend in the Asteria. Yes, this is a positive. The shoe will gladly let you pound on your heels, land in a relaxed fashion on your midfoot, or get up on your toes for speed. No problem. The Asteria permits and enhances rapid foot turnover, so you can “pick-em-up and put-em-down” rather quickly when doing speed training or seeking a PR. Before arriving at the verdict, you may notice that I’ve described the shoe’s strengths but no weaknesses. That’s because I have not noticed any weaknesses in the shoe, which is a good thing. The Asteria is a mild support racing flat. One might use it to run 5Ks, but that would not permit the shoe to play to its strengths. The Asteria is a light, high-quality shoe that can serve as a trainer for lighter, smaller and perhaps not naturally efficient runners. The rearfoot guide rail system builds confidence that one can maintain a level, consistent stride on race day. Yes, the system works, especially on longer runs. The Asteria flat is also a race day shoe best used in distance runs from 10K or 10 miles up to 50K. The Asteria allows one to experience joyful abandon on the track known as life. Thanks, Brooks! For the last 6 months I have done almost all my runs in Asteria. 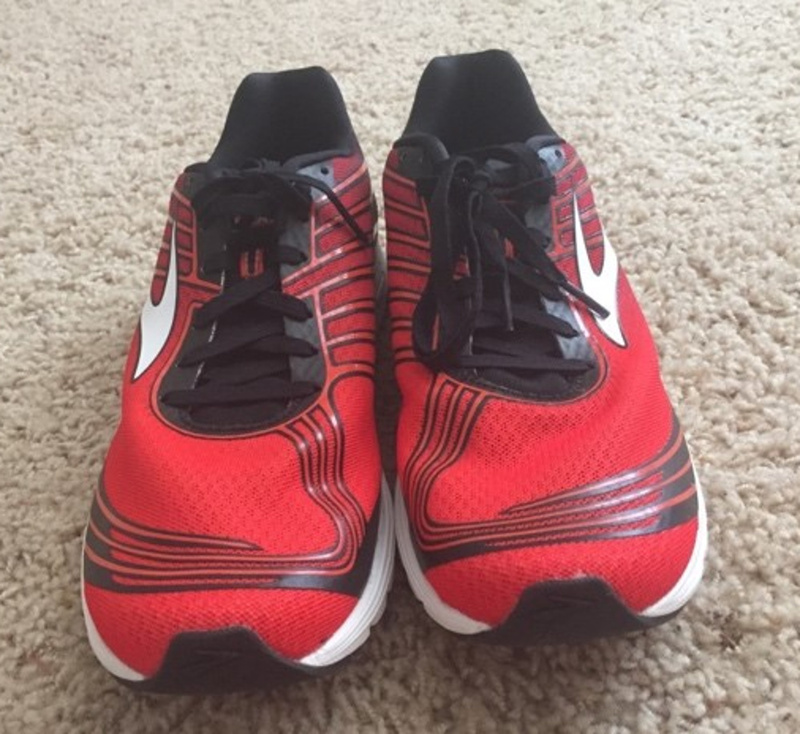 My other Brooks shoes are Ghost 10, Glycerin 16 and PureGrit 6, all neutral models, but on most, if not all, race flats I tend to have a pronation that is very mild but enough to trigger some inflammation. I decided to go for Asteria with a minimal degree of support. In fact, considering that most of my races are on a road with distances between 5K and a marathon, Asteria was a wise decision over a less forgiving model. For example, compared with a neutral race day flat shoe like Hyperion, Asteria has more cushioning and is more protective, which may help in preventing injuries for runners with an imperfect gait. You don’t feel fast as in Hyperion shoes, but if you are worried about an injury following an all-out race, it makes sense to lose a few seconds on a 5K or 10K instead of getting sidelined for weeks. Otherwise, if you have a perfect gait and your foot is not too wide, then you can go for Hyperion without worries. The upper mesh is very soft. It is a bit thicker and with a more padded tongue than most other fast shoes, but it gives it a lot of softness and allows the shoe to wrap your foot better. Sometimes a thinner upper mesh, like in Nike shoes, can be a double edge sword; you have an even lighter shoe but if it doesn’t fit perfectly, you may develop blisters or calluses as temperature and pace increase. My perfect shoe size is between UK 6.5 and 7. All my other Brooks shoes are UK 7. Ghost 10 in UK 7 is perfect for me, Pure Grit in UK 7 is fine, Glycerin 16 in UK 7 is slightly too big and so is Launch 5 in UK 7. With Asteria, I ended up with UK 6.5, half a size less than all my other Brooks shoes. For race day and speed sessions, I wanted to have a firm ride without any mush. Although I chose the half-size smaller than my normal Brooks fit, the shoe is wide enough (I can guarantee that I don’t have a narrow foot at all) and there is still room in the toe box. 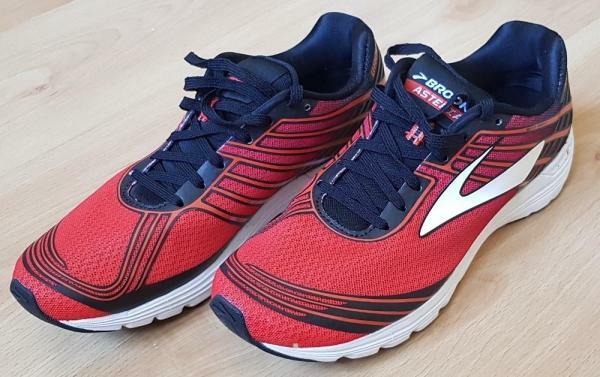 The insole and outsole together provide a very welcome cushioning and support, such that if you are a fairly light runner, you may consider this shoe also for a marathon distance. The stability support doesn’t feel cumbersome at all, but compared with some other light racing shoes, you can feel the 8mm drop. The outsole seems to provide a fair grip that is not the best for trails, but perfect for road or tarmac. Asteria is one of the lightest shoes offered by Brooks with a weight of 217gr for UK 6.5, which makes them ideal for running fast. Asteria is conceived for a steady race day pace but with a minimal amount of stability support and cushioning. In my opinion, they are suited for any distance from 5K to a marathon, but I would consider this shoe for the marathon distance only if you aren’t a heavy runner and have very small imperfections in your gait. Otherwise, I would go for a more supportive shoe or for Launch 5, another great shoe from Brooks. I tried several other competing shoes: New Balance 1500, Adidas Tempo 9 and Saucony Fastwitch. Compared with New Balance 1500, Asteria is wider and far more comfortable, but NB 1500 has a lower drop and I personally like the design more. In fact, I find the Asteria look a bit essential, and I think that in 2018 there are many more fashionable options. Meanwhile, compared to Adidas Tempo 9, Asteria has less support and is lighter. If (like me) you need only mild support, the amount of support provided by Tempo 9 may feel a bit cumbersome as the pace increases. The cushioning is more or less the same in both shoes, so the choice in this case really comes down to stability/support. If you need more support, then go for Tempo 9. Finally, Saucony Fastwitch is a neutral running shoe designed for fast sessions or races, and with Asteria, it provides a lot of cushioning. Between the two, if you don’t need much support but you cannot renounce the cushioning, then Fastwitch is a very good choice. Asteria has a fairly long life considering that it is a fast running shoe. The materials look to be of good quality and lead me to think that they may last 300-350 miles without any issue. The first point of failure looks to be the outer sole, the heel (if you are a heel-striker) or the forefoot area. Overall, I am very happy with the Brooks Asteria. I find it suitable for all distances from 5K to a marathon. The amount of support is not cumbersome and the shoe is very light, cushioned and comfortable. The only point that I didn’t like too much is the look; I think in 2018, Brooks could have done much better. At the end of the day, I care most about comfort, cushion, and lightness, and I think that Brooks has done a very good job from that perspective. I am happy to run races in these shoes. When I heard that Brooks would be coming out with a new supportive racing flat like the Brooks Racer ST 5, I could not resist the temptation of getting these shoes. In comparison, this shoe is like New Balance’s 1500 v3, Saucony’s Fastwitch 8, and Nike’s Zoom Streak 6. I have run multiple workouts on the track, road, and a few easy runs with this shoe and the Brooks Asteria definitely held up its end on the runs. The outsole has two ‘technologies’ that Brooks put in for runners’ benefit: Forefoot propulsion pods and the blown rubber. The forefoot propulsion pods are to be square-like pods that “help spring your foot forward for maximum energy return.” Now, for me, being a guy who ran in the Adidas Supernova, I could not feel myself being sprung forward, nevertheless energized on any of my runs. On the other hand, the blown rubber has great traction for wet surfaces, track, and typical dry sidewalk while holding up its composure with many workouts I put it through. Overall, the outsole boasts of energy returning design and durable blown rubber: One of the two lived up to its description. Brooks euphemizes the crash pad to make it sound different than all of the other ‘customized’ midsoles out there because I did not feel a difference between their crash pad/midsole and other shoes’ midsole. For the Omega Flex Grooves, I did not really feel as much flexibility with the shoe which made my faster runs/workouts less natural and more rigid. Whenever I ran my workouts or faster runs, I did not notice the guide rails and its functionality; however, whenever I ran slower, I could notice the guide rail and its assistance. All in all, the midsole lacks to live up to its euphemized description and feels like a typical stability racing shoe. The greatest part about this shoe is the upper. There are so many key features that make the upper the greatest part of the shoe: the breathable and seamless mesh that adapts to your gait, and 3D fit print that locks down and supports your foot. Additionally, the tongue and shoelaces make the whole upper a masterpiece. The tongue is extremely comfortable to run in because of the amount of cushion it has. It has oft mesh-like quality. I do not typically wear Brooks often, but I came across the best shoelaces I have ever tied! The shoelaces stretch whenever you tie them, so there is less tension on the easiest foot bone to fracture or break (since it protrudes and needs extra loosing of the shoelaces in that particular area); so, that means there are more stability and unity with the shoe and foot. In total, the upper was the best part of the shoe and exceeds any expectation of what an outsole can really accomplish. The Brooks Asteria is a great performance stability shoe if you are looking for something that is lightweight and designed for races of all distances, up to the marathon. The Brooks Asteria is a stability running shoe that features the BioMoGo DNA midsole cushioning that is designed for a more responsive ride. It adapts to every step and gait. The shoe also features the rearfoot guide rails that guides the foot to move naturally through the heel-to-toe transition. It gives support as the foot move to its natural movement pattern. The segmented crash pad strategically place in the midsole and flexes with the foot. It gives added cushioning and stability for a fast heel-to-toe transition. The Brooks Asteria is true to its size. It provides a medium fit in the heel and midfoot area while the forefoot is a bit narrow. This shoe is best for runners with narrow to medium foot measurements. It is available in D and B medium widths and sizes available and 5 to 11 for women’s and 7 to 14 for men’s. The outsole unit of the Brooks Asteria uses a blown rubber that can also be found in one of Brooks popular stability shoe, the Ravenna 10. This outsole offers a great combination of durability, flexibility and responsiveness. The propulsion pods also help runners experience a more powerful energy return by aiding the foot to move forward. The midsole of the Asteria uses the BioMoGo DNA cushioning technology that delivers reliable cushioning. It delivers a fully personalized responsive ride that adapts to the runners’ gait cycle. This works well with the Omega Flex Grooves that is designed to enhanced midsole flexibility while giving added cushioning. The Guide Rails direct the foot back as it moves to its natural foot movement pattern. It guides the foot for a smoother heel-to-toe transition. Giving added flexibility in the midsole is the segmented crash pad that flexes as the foot moves. It provides a personalized cushioning and stability for a smoother transition from heel to toe. The upper of the Brooks Asteria is made up of breathable mesh material that wicks moisture away, keeping the foot dry all the time. The underneath linings aid in keeping the foot moisture-free and giving comfort all through the run. The 3D fit printed overlays are strategically added to provide a seamless and adaptive fit, keeping the foot securely locked all throughout the race. The sockliner which is made up of BioMoGo foam is designed to give added cushioning and contoured support.